In the latest issue of Comunicar, a theme that has received intensive discussion in the recent decade leads a series of research articles: Shared science and knowledge, Open access, technology and education. Among the serial articles, one of them draws my special attention: Soler-Adillon, J., Pavlovic, D. & Freixa, P. (2018). Wikipedia in higher education: Changes in perceived value through content contribution. Comunicar, 54, 39-48. Given to the prevalence of wikipedia in our daily internet use as well as in academia practice, the authors conducted experiments that compared how students perceive the reliability and usefulness, and of likeliness of finding false information on Wikipedia. A significant change of perception on the above aspects was found before and after students got a chance to edit contents on wikipedia. Their appreciation of the task of writing Wikipedia articles, in terms of it being interesting and challenge also increased. This article stimulates my further contemplation on one of the latest fashion in teaching method: flipped classroom. Recently, I attended a workshop organized by universities in Hong Kong. In the workshop, concepts and practical experience regarding this teaching method was introduced. Basically, the rationale behind is that, students in today’s digital age have mastered various means of knowledge acquisition, especially with the assistance of the internet. Therefore, the role of teacher shall be transformed from instructor to coach/tutor. And the function of classroom shall be more for discussion than for one-way lecturing. Participatory platforms such as MOOC, Moodle and to name a few should play a leading role in the process of education because students living in the digital age shall be more interested in and inclined to interactive two-way communication. Wikipedia, in this regard, is a vivid example and exemplar of participatory media. Shall it be a primary means in university teaching? Or, when students are told to search information on their own, how to guarantee the quality of knowledge they have “acquired”? Besides the primary and ultimate issue of “how to stimulate students’ self-learning motivation”, media and information is of particular importance in this regard. In the previous blog entry, Prof. Alice Lee addressed: media and Information Literacy (MIL) are the combined capabilities of Media Literacy, Information Literacy and ICT. It means to search, evaluate, use and create media messages and information efficiently from any platform (Internet, media, library, museum, database, etc.). Teaching is never a problem of teaching method, in my view. In the old days, as long as students are highly self-motivated, traditional teaching methods such as one-way lecturing or multi-way communication in seminar, deliver knowledge and stimulate new thoughts effectively. Great thinkers learn in libraries, classrooms, reading clubs and on their owns, instead of on MOOC or Moodle. Vice versa, without strong and critical media and information literacy and embracing little self-motivation, students, even given a large variety of learning options, will fail to receive high-quality education. 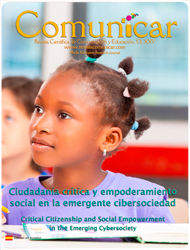 The latest issue of Comunicar (Vol. XXV, n. 53, 4th quarter, October 1 2017) (https://www.revistacomunicar.com/index.php?contenido=revista&numero=53) sheds lights on one of the most popular topics in nowadays academia – cyber activism and empowerment. A meta-analysis leads four specific empirical studies based in different nations and regions. In this current issue, papers such as “Cyberactivisim in the Process of Political and Social Change in Arab Countries” and “Protesting on Twitter: Citizenship and Empowerment from Public Education” prove the prevalence and importance of digital-aided communication in protests that are both contentious and on everyday bases. The former one highlights the sustaining of movement networks that allied citizens from contentious moments to the ever longer period of “movement awaited” – the ebbs and flows of protests. The latter one offers a mapping of how anonymous citizens reacted to governmental decisions on the online platform. That said, the spectrum ranged from connective action and collective action spans from one end of human-organization based to another anonymity end that is fraught with uncertainties. In “Cyberactivisim in the Process of Political and Social Change in Arab Countries“, human networks still contribute greatly in terms of protest mobilization and more importantly, bonding the morale when external stimulus demise. “Protesting on Twitter: Citizenship and Empowerment from Public Education” pointed out that, while the online platform is free from a lot of restrictions which hinder people’s participation in previous age, the citizenship, by all means, is actualized through people’s active social conscious and empowerment that is educated and practiced in everyday life in the real world. New challenges such as human’s substitute AI (artificial intelligent) produce puzzles which are unsolvable at this stage, among which a crucial question goes to whether AI can really think. Perhaps AI can help with household chords while there is still a long way to go before AI can take an active role in the world – the learning, practicing and reflecting what do human mean to the society, and vice versa. We inform you that the latest issue of «Comunicar», 48, has been recently published with the suggestive title: «Ethics and plagiarism in scientific communication». As on previous occasions, the journal has a monographic section and a wide variety of items in its miscellaneous section. All articles are available full text and free of charge on our official website. «Comunicar» is a quarterly, bilingual Spanish-English research journal, with Chinese and Portuguese abstracts. Articles, authors and topics have a decidedly international outlook. The journal is now in its 23rd year and has published 1671 research and studies articles. The journal appears in 312 international databases, journal impact assessment platforms, selected directories, specialized portals and hemerographic catalogues… A rigorous and transparent, blind reviewing system manuscripts audited in RECYT. It has an international scientific editorial board and a broad network of 445 reviewers from 33 countries of all over the world. Professional management of manuscripts via the OJS platform from the Science and Technology Foundation, with ethical commitments published for the scientific community that ensure transparency and timeliness, antiplagiarism (CrossCheck), reviewing system… It is a highly visible publication available through numerous search engines, dynamic pdfs, epub, DOIs, ORCID… with connections to Mendeley, RefWorks, EndNote, Zotero and scientific social networks like academia.edu, Researchgate. A specialized journal in educommunication: communication and education, ICT, audiences, new languages…; there are special monographic editions on the most up-to-date topics. It has a printed and an online digital edition. The entire digital version can be freely accessed. It is co-edited in Spain for Europe, and in Ecuador and Brasil for Latin America. Comunicar has also an English and a Chinese co-edition. In 2016, «Comunicar» is indexed by JCR-WoS (IF 1.438, Q1). Scopus classifies it in ‘Cultural Studies’ as Q1, ‘Education’, and ‘Communication’ as Q2 (SJR 0,472). It is Journal of Excellence RECYT 2016-19 and also indexed by ERIH+. Google Scholar Metrics 2015 categorizes «Comunicar» with an H5-index 22 and a h5-median 41. Applications from Neurosciences to other scientific fields and specifically to the social sciences have been done for over ten years. The best known are the investigations of Damasio on the ability of emotions to access and organize information, Lakoff‘s research on neurolanguage and its derivations to political action, Schreider’s neuropolitics or applications of mirror neurons to the voting decision process, or also experiments around the topic of “neuromarketing / neuroshopping”, and the relationship between brain, advertising and choice purchasing carried out in laboratories Iacoboni at UCLA, to name a few. The conclusions of neurosciences and related sciences are radically changing everything on access for individuals to information and knowledge. We are interested in the conclusions of these cutting-edge science regarding the basic organization of social communication: for example the idea that the environment is not a structure imposed from the outside but a creation of living beings themselves, or how the network model manifests and expresses a “distributed intelligence”, a “swarm intelligence” or “connective intelligence”, with its neural leads to the extent that the communicative act is not a simple message transfer but an interaction of codes with commonalities. This has exponentially been sponsored by the advent of Information and Communications Technologies (ICT). In fact, it would not be too much to say that the “connective intelligence” embodies the best way of thinking and relating in the new network society, because it establishes a simultaneous and significant connectivity between multiple users, according to CALL FOR PAPERS, 52 (2017-3) the diagrams “one-many”, “many-one”, or “many-many”, because it drives a playful interactivity between users, because it replaces the variable “geographical proximity” for that, typical of cyberspace, where the connection is established based on interests and shared preferences and because it seeks to accelerate the synergy of the decentralized knowledge processes. The objective of this CFP is to promote research that contributes to the understanding of how the social brain or connective intelligence affects the functioning of the process of creating an opinion, setting behaviors, changing perception, attitudes and habits, and as derivatives, understanding how public opinion is formed, how purchasing or voting decisions are established. Topics  Access to channels of information and knowledge  Formats derived on education and training  The creation process of Public Opinion  The configuration of behavior in current society  The change of perception and the evolution of attitudes and habits  The process of Purchase decision-making  Mass Media and voting choice  Entertainment and leisure channels in the hyper-connected society  Uses and effects of Information and Communications Technologies in decision-making process  Social Networking and opinion configuration process  New strategies and trends in the field of Neurocommunication and Neuromarketing  Neuropolitics and new communication strategies in the electoral field  Research proposals in the context of applications of neuroscience to Social Sciences (Economics, Psychology , Education, Politics, Law … ) As priority, research papers on communication and education are requested, especially the intersection of both: media education, media and educational resources, educational technology, computer and telematic resources, audiovisual technology… and also reports and studies on these same subjects are accepted. Recently, members of the Community Communication section in IAMCR (International Association of Media and Communication Research) have had intensive discussion about the “branding” of the section. According to the section chairman, Dr. Arne Hintz, “‘community’ was regarded by most respondents as highly important for the section, followed by ‘citizen’, ‘social movement’, and ‘alternative’. The term ‘participatory’ was seen as significant, too”. From this brief discussion, we could see some fundamental elements of community media. First of all, it is not only simply about a physical and territorial community, but about the organic integration between human activity and the community. Secondly, it projects an essential part which is closely related to social movement, or at least related to participation of citizenship. I would say, this is highly Marxist. This approach of community media emphasises the bottom-up social change and the active role of human beings. What’s more, it also connotes the pursuit of “alternative”, which, again very Marxist in terms of anti-capitalism. To deduce the simplicity, I would like to add, community media tries to create a platform for citizen empowerment, whose efforts are seldom valued by the mainstream society. More often than not, community media is for those marginalised groups, who are neglected or stigmatised by the mainstream society, suppressing the outlets for them to speak out. That’s why they need a unique platform to express their concerns, as well as to gain the empowerment through mutual-aid among their community peers and cross-community activists. I would like to introduce several community media platforms in Hong Kong. v-artivists: returning art to people. art is part of everyday life; art is full of diversity and locally based; art could be as popular as everybody can take control of several resources; art is based on mutual respect and appreciation. grass-media: interns join this platform to learn how to discover the hidden voices in the society and how to let grassroots people make use of media tools. ODAAG: old district autonomous alliance group to fight against gentrification. Andres et al. provide an insightful analytical framework to examine how the photograph of Aylan Kurdi engenders social transformation on the Syrian refugee crisis. The iconographic and iconological analyses in the article verify the power of visual images to provoke strong emotions—by mobilizing social conscience, they induce solidarity. “An image for solidarity is an image that can be appropriated by citizens to enable them to express themselves, to denounce and to recreate” (Andres et al. 2016). The process in which the widely circulated Aylan photograph turns into a solidarity movement operates in a grassroot communication model, in which citizens participate by engaging the image in a chain of resignification. The semiotization of the Aylan photograph must proceed within the rules of the medium—photography—which Andres et al. have addressed in their iconographic analysis. The way in which photography is produced and reproduced is central to the medium’s ability to make meaning and induce social change. With that in mind, Walter Benjamin’s conceptualization of photography as mechanical reproduction of art presents three aspects that complement with Andres et al.’s framework. Benjamin’s conceptualization is located within the context of photography, by capturing still images, reproduces real life situations, which in this case is the historical context of Aylan washed up drowned on a beach in Turkey amid the Syrian refugee crisis. The first aspect of pictorial reproduction that has to do with the capacity to induce solidarity is that photography can bring out aspects of the original that is unattainable with the eye yet accessible through the lens. When one encounters the Aylan photograph, the naked eye may not perceive the full emotional impact one does through the lens, due to the lack of photographic technique such as the emphatic subjectivity of the low angle and the sense of impotence induced by the shallow depth of field. Such process reproduction of the scene assists in amplifying the beholders’ emotional response, thus mobilizing social conscience. Second, technical reproduction can put the copy of the original into situations which would be out of reach for the original itself. The wide circulation of the Aylan image is attained largely due to the reproducibility of the photograph. And without vast dissemination channels such as social media, the image may only be seen on a few newspapers. Reproducibility of the photograph coupled with dynamic media networks make the image available in the public sphere, which is prerequisite for solidarity. Third, mechanical reproduction permits replicas to meet the beholder in his own particular situation. Although reappropriation of the image sparks ethical debates, it contributes to the formation of solidarity when audiences actively engage with the image within their own contexts. An individualized view of the issue makes it meaningful to every beholder in their own distinct approaches. The bottom-up assemblage of individual will burgeons into a collective solidarity movement. In Benjamin’s original conceptualization, mechanical reproduction was shed in a negative light for its destruction of the original’s “authenticity.” Today, pictorial reproduction becomes central to positive social change, with its unique capacity to get “closer” with citizens, ultimately leading to meaningful social action. Benjamin, Walter. “The Work of Art in the Age of its Technological Reproducibility.” In Film Theory and Criticism, edited by Gerald Mast and Marshall Cohen, 675-94. New York: Oxford University Press, 1985.